(Stage 1-10): 14 days, 241 km's pilgrimage (149 miles). 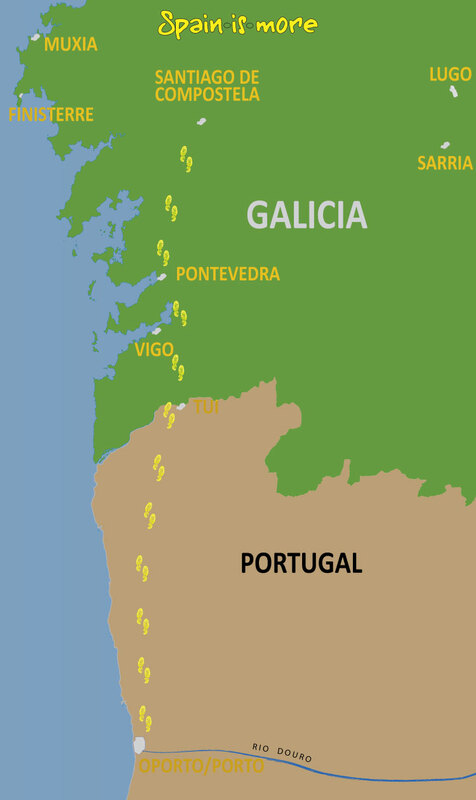 The Portuguese Way, also called Camino Portugués, has become the second and most frequented pilgrimage route of all. Almost 20% of all pilgrims arrive to Santiago in this way. The starting point is the city of Porto (Oporto) in Portugal. From here the route takes you through the beautiful, green and soft hills of the Portuguese hinterland to Tui, where the route crosses the border into Spain. From here on, the landscape becomes even more breathtaking with the highlighted by nature around the city of Vigo where you have a wonderful view over the bay. The Camino Portugués consists of an ideal mix of exiting culture, beautiful and varied natural landscapes, big cities, history, beaches, hilly woodland, rivers and idyllic villages. As far as some of the highlights along the route, it´s worth mentioning the Cathedral of Porto, the Old City of Ponte de Lima, the fortified cities of Valença and Tui, the bay views, the many idyllic villages, the cities of Pontevedra and Santiago de Compostela and, of particular notice, the abundant nature along the whole route. This is an exciting and historic journey that every pilgrim will enjoy. ✔ Daily Departures from March to November. ✔ Hotel-to-Hotel Baggage Service is optional. ✔ Your personal Pilgrim's Passport. ✔ Specially Selected Hotels - always with private bathroom - selected for best location, service and authentic charm. ✔ Spain is More Camino Guidebook (which you will receive some weeks before departure) contains practical pilgrim information, suggestions for packing list, recommended restaurants, maps of all cities along The Camino- and hotel location, Pilgrim's Passport/Credential, advice and guidance, service phone numbers and much more, all to make your trip on The Camino an experience of a lifetime! ✔ Dividing stages: Yes, sometimes. ✔ Day trip to Finisterre.
? NOTE: nowhere, in any Camino, will steep cliffs be found next to path! 1: Very easy. Flat and without significant gradients. Good and normally wide paths. 2: Easy. Slightly hilly. Good and normally wide paths. 3: Medium. Hilly, possibly with longer distances between service facilities/cities. Good, sometimes narrow paths. 4: Medium/Hard. Longer, steeper climbs, perhaps with few servicefacilities/cities. Good, sometimes narrow paths. 5: Hard. Long gradient(s), possibly few facilities. Very hilly. Good, sometimes narrow paths. The terrain of the first two stages of this stretch are very varied. The first, after Porto is flat and runs through an industrial area. The hills and nature begin almost as you are finishing this stage and last for the rest of the trip. The are hills are easy, in general, the stretch interesting with beautiful landscapes with a few inclines. The stages are divided so that the longest are the easiest, and the shortest, a little more difficult. In the section "Stages" you will find more detailed information of each stage, as well as maps of the profiles of each stage with photos. Possibility of dividing the Stages: Yes, some. See under Description of the Stages. The services are quite good along the whole stretch, but there are not as many as on other roads. You have restaurants near the hotel in all the villages where you will stay. In the villages through which you will go, you will find all the services you need like supermarkets, pharmacies, banks ... etc. The written guide for Spain is More, that you will receive a couple of weeks prior to departure on your trip, contains practical information about the pilgrim's office, restaurants, maps of towns and cities along the way, information on the location of hotels, telephone numbers, what to do in case of an emergency and many other things that will make your pilgrimage the experience of a lifetime. After getting to Redondela, the terrain provides slightly more incline than during the previous section. But, you will never climb higher than about 200m. After Ponteveda, you will find some stretches through the beautiful and green Galician woodland. Here the terrain rises and falls while you continue towards Santiago. It's an amazing section of the trip, where you will often pass by Galician vineyards. Arrival in Porto and check-in at hotel. The hotel is a 4-star hotel with a central location in the old city of Porto. You will be free to dispose of the whole day on your own in this beautiful city. The historical core of the city is full of charm and was proclaimed a World Heritage Site by UNESCO in 1996. Interesting monuments, history, the beautiful location and not to mention the port, are some of the reasons why you should visit this city. An interesting visit that permits you in one day to walk the equivalent of one stage of the Pilgrimage Route. The ”Camino” (”Caminho” in Portuguese) starts at the cathedral of Porto by the name of 'Sé'. From here you primarily travel through the suburbs of Porto. Later, the terrain turns greener and according to most pilgrims more beautiful. If the stage-length seem to long, we recommend to take a taxi or bus the first 5-10 km. out of Porto. After Vilarhino the countryside becomes even more rural. The route is seasoned with a wonderful medieval bridge as well as with some historical churches. In the afternoon/evening you will have plenty of time to experience the old fair city of Barcelos. Today´s route is the longest of them all, but without mayor climbs and a relatively easy terrain. It is a beautiful stage that brings you through vineyards. Ponte de Lima is a charming city with a very famous market that dates back in time to year of 1125. The ancient 277 meter long medieval bridge from 1368 represents the most important sight of the city. The route continues from Ponte de Lima by crossing the famous bridge. After Ponte de Lima you will soon find yourself in rural surroundings. This particular stage is not very long, but on the other hand you are encountered by a climb of some 2 km which is the most challenging of the Portuguese Way. Once again a short stage which commences with a light climb. The way leads you through woods and fields to the old fortified city of Valença. Here you should experience the old fortress and fortification. From here the way crosses the river Miño and brings you into Spain, to Tui, and its famous cathedral. Tui is a cosy city full of life, good restaurants and with a very exciting history which is all about the many wars against Portugal. If you want another distribution of the stages and you do not mind not spending the night in Tui, you can opt to walk approx. 5 km more –and the corresponding 5 km less the day after whereby the two stages are almost of the same length. A relatively long stage with only single (but still somewhat difficult) climb en route. Nevertheless, the stage is within reach of most people. There are very few alternative overnight accommodations half-way which is why it is difficult to cut this stage into two. On the other hand, this stage is probably the most beautiful of all of the Portuguese Way, particularly the way through the valley of Rio Louro. Today you will have a few climbs on your way to Pontevedra, but you will also be walking through the very heart of Galicia! Along the way you will get to see the famous stone crosses (Cruceiros), which for centuries have guided and protected pilgrims on their way to Santiago. Several of these small masterpieces are dated back to the 15th century. When you reach Pontevedra, you can visit various churches, monasteries and monuments of the city, go shopping in the city's old quarter (Casco Viejo), or enjoy the vibrant nightlife and the many excellent restaurants - and of course, taste a glass of the local Albariño white vine. After leaving Pontevedra's Old Town Centre, the route quickly takes you to one of the most beautiful sections of this part of the Camino. Among other things, you will pass the area of Barro with absolutely wonderful waterfalls, and later Briallos, the latter leading you through scenic vineyards of Galicia. In Caldas de Reis you will have the opportunity to enjoy one of the many thermal baths which Galicia is famed for. Today you arrive at Padrón, the next most important pilgrimage city after Santiago de Compostela. According to ancient legend, the Apostle Saint James is said to have preached on the Iberian Peninsula. The tradition has that after being beheaded in the year 44 AD, the body of Saint James arrived by boat to the Galician coast navigated by two of his disciples from the city of Jaffa in Palestine. From here, his corpse was carried to Padrón, because the Apostle James is said to have preached at Monte de Santiaguiño. In Padrón, a long and very beautiful stairway leads along the Mosterio Convento do Carmen to this sacred place that is definitely worth a visit. The route to Padrón is as beautiful as the former pilgrimage route, and there is an overall special atmosphere in the small town of Padrón, with its mere 3,000 inhabitants. This is the last of your 13 pilgrim’s stages towards Santiago de Compostela. Whether it is your first pilgrimage, or you have done it several times, you will undoubtedly notice a very unique contrast of excitement while feeling an unexplained serenity throughout your body, both at the same time the closer you come to Santiago. The route from Padrón to Santiago starts with some walking along the road, but soon you get back to the small and charming paths and dirt roads, which you know so well from the previous days. About seven kilometres from Santiago, you can see the Cathedral's two iconic spires for the first time, and from here there is only path to reach your goal of arriving to Santiago. When you enter the Plaza de Obradoiro in front of the Cathedral, which may already be filled with happy, tired and redeemed pilgrims, you will most likely see some others you have met on your way to Santiago. Perhaps, you have made new friends along the way, and maybe, you will find that these friendships will grow stronger and evolve over time – Buen Camino! True pilgrims continues further and finish their journeys in Finisterre. The tour goes by bus with an English-speaking guide from Santiago to Finisterre in the morning and returns mid-efternoon to Santiago. Just off the stunning, rugged coastline and the fabled “Costa de la Muerte” (Death Coast), a reef filled with shipwrecks and tales of legends captures a raw, natural beauty. On the coast’s westernmost point is Finisterre – meaning the world’s end. Romans named this coast because it was literally the end of the known world. For many pilgrims this is the symbolic endpoint of the pilgrimage. The evening is spent in Santiago de Compostela. From 990 EUR/pers. Per person in a double room. 13 nights in a double room - always with private bath/toilet. The price includes 1 Spain-is-More-Travel Guidebook per every 4 travellers. More copies can be purchased when booking for 20€ per copy, or 30 euros per copy if the request is less than 6 weeks prior to departure. City tax in Porto. 2€/person/night. Personalise your Camino: Extended stays, divide stages, transportation to startingpoint from anywhere in the world and back. Please ask us, we will be happy to assist you. Baggage Transport on the pilgrim route can be purchased. If you buy a luggage service your bag / suitcase will be transported from hotel to hotel on the scheduled days of hiking. Price 120 €/unit of max 20 kg. Extension of stay in Porto, Santiago or elsewhere. The price include 1 Spain-is-More-Travel Guidebook per every 4 travellers. More copies can be purchased when booking (20€/copy).